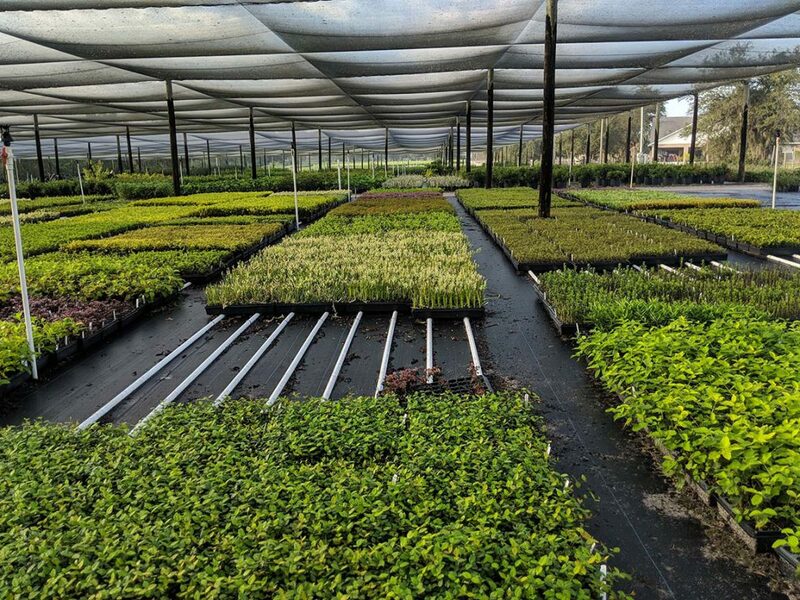 Joe’s Nursery began just as an idea between Joe Shook and his wife, Susan. After saving money for about six years, the couple took a leap of faith to start their own nursery. Drift roses, loropetalums and woody ornamentals are the primary cultivated plants at Joe’s Nursery. Shook’s main clients are in South Carolina and use their own “fleet of trucks” to ship plants north. 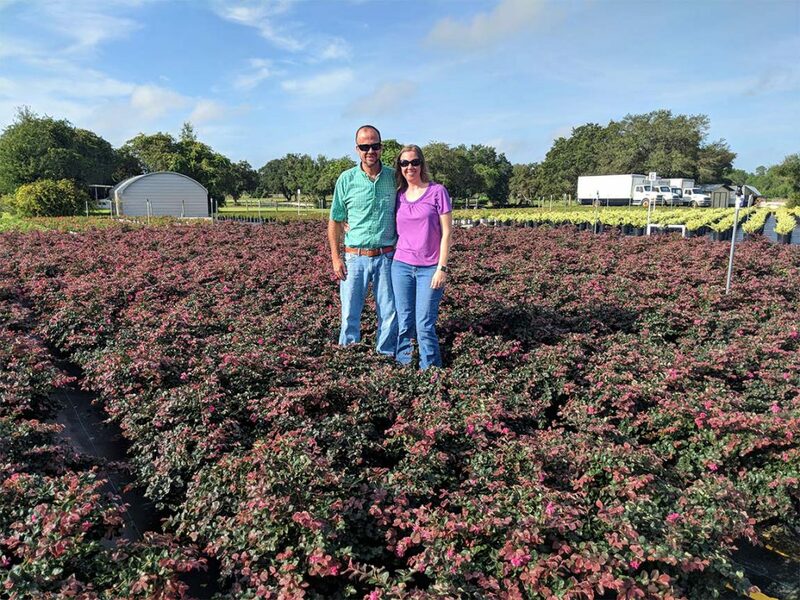 Joe and Susan Shook, owners of Joe’s Nursery, stand among loropetalums, their top selling product. During Shook’s undergraduate years at the University of Florida, he ended up changing his area of study to focus more on agriculture. He found his passion for plants, changed his major and became interested in agribusiness and nursery production. Shook started his business venture with Joe’s Irrigation, LLC., and learned about irrigation systems, how to install them and business management. This knowledge was then carried over into Joe’s Nursery. A selection of Drift roses at Joe’s Nursery. One of Shook’s business tips is to do as much work yourself so avoid hiring an outside company. The bookkeeping, irrigation system, plant propagation, building shade structures and truck shipment of plants are all done by Shook himself, Susan and his team to keep costs down. The nursery also does not use benches in their shade structures but balances plant trays on PVC pipes to decrease costs and maintenance. Notice the PVC pipes used in Joe’s Nursery’s shade structure to keep plant trays off the ground to avoid disease issues. Another business tip is to save money by living frugally to a) be able to buy property when the market prices are low and b) avoid owing money to investors or banks during economic downturns. Shook suggests to buy property little by little and slowly expand your business. Shook notes his ideals are simple: family first, good customer service and quality products. Recently, Shook was able to purchase additional land to grow his business to its current size of 12 acres. With these ideals, business savvy and newly acquired land, we are excited to see what the future holds for Joe’s Nursery. I just traveled thru SC. Where is Joe’s Nursery located? I’d love to visit on my next trip. Renee Enlund, Master Gardener Bay Co. Fl. 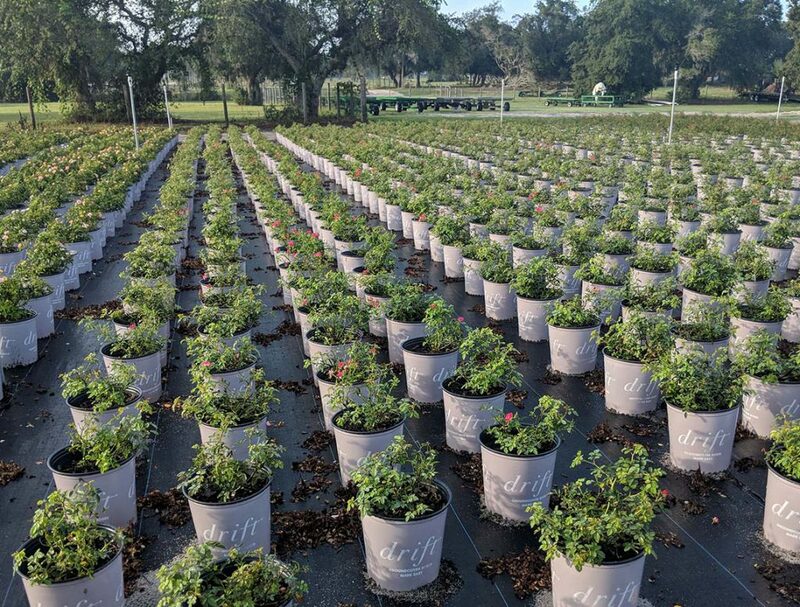 Joe’s Nursery is located in Florida but the nursery ships items to South Carolina for clients. So unfortunately you would not be able to visit the business for future travels.